With the arrival of Tropical Cyclone Winston, the government of Fiji has declared a state of natural disaster and has imposed a curfew. Reports from Fiji suggest severe damage to towns and villages as 200mph gusts swept across the islands. Estimates suggest that nine out of 10 people on the islands are without electricity. Tropical Cyclone Winston is believed to be the first Category 5 cyclone to reach the islands. The cyclone began to make landfall on the main islands of Fiji late on Saturday afternoon (local time). All models indicate that Winston will travel towards the west on Sunday as a Category 5 cyclone, with further indications of a southward shift in direction, leading to a decrease in intensity as Winston approaches higher latitudes. The southern hemisphere tropical cyclone season normally runs from November to April and so far this season’s activity in the South Pacific Ocean had been relatively low. 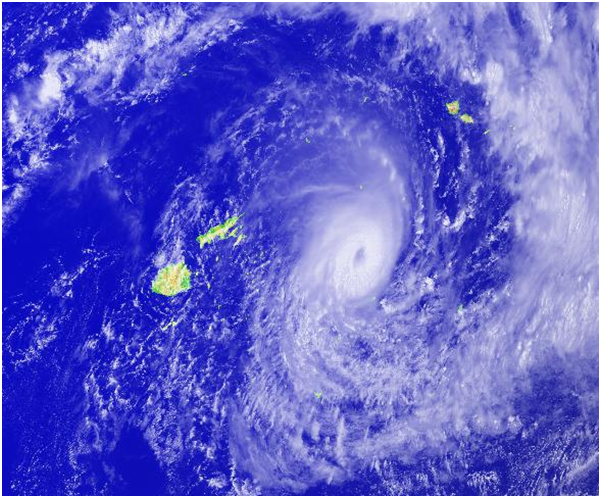 Just two tropical cyclones have formed which have reached the equivalent of hurricane strength: Ula and Victor. Around 10 days ago Tropical Storm Winston formed just to the east of Vanuatu in the South Pacific. The storm initially moved southwards passing to the west of Fiji with winds strengthening to more than 100 mph. Winston then started to weaken, but instead of continuing on a track towards higher latitudes, made an unusual turn north-eastwards. Despite weakening to a tropical storm as it did so Winston brought heavy rain to parts of Tonga earlier this week. Having stalled just south of Samoa, Winston then started to restrengthen and made another sharp turn towards the west. Cyclone Winston at 0200 UTC on 19 February 2016. Meteorologists will continue to monitor the track of Cyclone Winston and provide updates as more details are known. 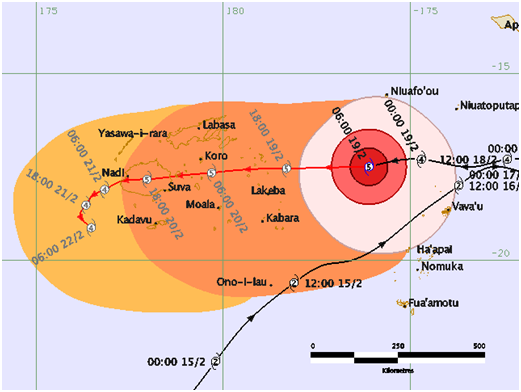 On Friday wind speeds averaged over 10 minutes were estimated to be near 125 mph near the centre of Winston with higher gusts, but following the cyclone’s increasing intensity wind speeds of The forecast track took the centre of the cyclone initially across the smaller eastern islands of Fiji and eventually over its largest island of Viti Levu which includes the capital Suva. Winston is likely to maintain its current intensity and bring up to 400mm rain. With the combination of strong winds, heavy rain and storm surge the islands’ authorities are fearing significant damage and destruction across the islands over the weekend. Cyclone Winston forecast from the Fiji Meteorological Service, valid 0720 UTC. Official warnings for the tropical cyclones in the South Pacific are produced by the Fiji Meteorological Service. The Met Office routinely supplies predictions of cyclone tracks from its global forecast model to regional meteorological centres worldwide, which are used along with guidance from other models in the production of forecasts and guidance. We also provide updates on current tropical storms via @metofficestorms on Twitter.